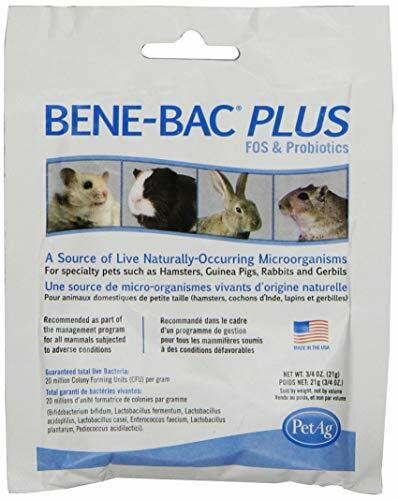 Bene-Bac Pet Gel is a concentrated live culture of seven common digestive bacteria found in the intestinal tracts of mammals. Recommended any time an animal experiences stress from changing nutritional or environmental conditions. Contains 20 million CFU per gram of viable lactic acid producing bacteria. Bird Bene-Bac is a concentrated live culture of seven common bacteria found in the intestinal tracts of birds and reptiles. Bird Bene-Bac gel guarantees 10 million colony forming units (CFU) per gram of viable lactic acid producing bacteria. 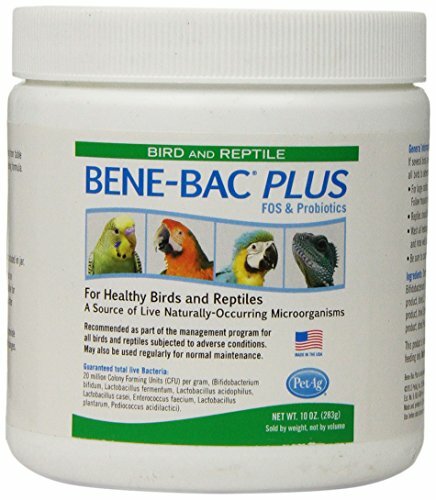 Bird Bene-Bac provides help for birds and reptiles under adverse conditions such as showing, weaning, worming, surgery, traveling, boarding, breeding, antibiotic therapy or simple intestinal stress. Recommended as part of the management program for birds when hand feeding or weaning from hand feeding. Use with growing and mature birds or reptiles when they are subject to changing nutritional or environmental conditions or after antibiotic therapy. Bird Bene-Bac Gel is available in 15 gm gel form in an easy to use dial-a-dose syringe. Contains live, naturally occurring microorganisms. Recommended for foals during first weeks of life. Good for horses after worming and antibiotic treatments. Helps horses in heavy training and prior to transportation. Easy to use dial-a-dose syringe. Stressful times can take their toll, on you and your pets. 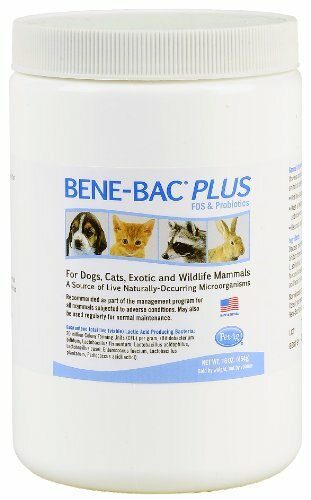 Bene-Bac Plus contains live, natural microorganisms that are found in your pet's digestive tract. You'll feel better knowing your sweet pup or kitty is getting a supplement to combat the effects of new environments, weaning, and so much more. 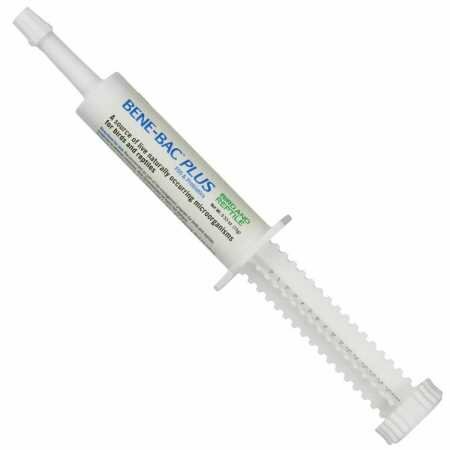 Bene-Bac Plus is easy to administer and available as a 15 gram syringe that can be given directly by mouth or 1 gram doses that can be mixed with food. Your pet will feel better and so will you. Bene-Bac Pet Gel contains live, naturally occurring microorganisms. It includes Prebiotic FOS as a source of carbohydrates. It is recommended any time an animal experiences changing nutritional or environmental conditions. Give the indicated amount when a new pet arrives home. It can also be used when traveling, 1 to 2 hours after worming, at birth, prior to supplementing the newbornâ€™s diet with milk replacer, at weaning, when dietary changes occur or as indicated by your veterinarian when pets are treated with antibiotics. Contains live, naturally occurring microorganisms. A concentrated live culture of seven common microorganisms found in the intestinal tracts of mammals. A guaranteed 20 million colony forming units (CFU) per gram of viable lactic acid microorganisms. Help for animals under adverse conditions such as: birth, post surgery, antibiotic therapy, weaning, worming, traveling. PetAg® Bene-Bac® Plus Bird & Reptile Probiotic Gel is a concentrated live culture of seven common bacteria found in the intestinal tracts of birds and reptiles. Bird Bene-Bac® Gel guarantees 20 million colony forming units (CFU) per gram of viable lactic acid producing bacteria. Bird Bene-Bac® provides help for birds and reptiles under adverse conditions such as showing, weaning, worming, surgery, traveling, boarding, breeding, antibiotic therapy or simple intestinal stress. Recommended as part of the management program for birds when hand feeding or weaning from hand feeding. Use with growing and mature birds or reptiles when they are subject to changing nutritional or environmental conditions or after antibiotic therapy. Made in the USA. Contains live, naturally occurring microorganisms. Prebiotic FOS a source of carbohydrates. A concentrated live culture of seven fat encapsulated microorganisms found in the intestinal tracts of birds and reptiles. A guaranteed 20 million colony forming units (CFU) per gram of viable lactic acid producing bacteria. Prebiotic FOS a source of carbohydrates. Contains live, naturally occurring microorganisms. A concentrated live culture of seven fat encapsulated microorganisms found in the intestinal tracts of birds and reptiles. A guaranteed 20 million colony forming units (CFU) per gram of viable lactic acid producing bacteria. PetAg Bene-Bac Plus Pet Gels are recommended to insure your pet's normal digestion while also helping to ease issues your pet may experience due to stresses from changing nutritional or environmental conditions. Now it is even easier to select the right formulation for your pet. Simply choose your pet from the selector above and you will receive the exact Pet Gel your pet needs. Every Bene-Bac Pet Gel multidose syringe provides a concentration of seven beneficial live-culture probiotic digestive bacteria. Bene-Bac Gel probiotics are fat encapsulated to insure maximum survivability through the stomach acids of the digestive tract to reach the intestines. Every product is "Safety-Sealed" and secured to a hard-card backing insuring your product arrives safe with no loose syringes. Use the easy to use dial-a-dose syringe to give the indicated dose when a new pet arrives home, when traveling (before departure and upon arrival), one to two hours after worming, at birth, prior to supplementing the newborn's diet with milk replacer, at weaning, when dietary changes occur or as indicated by your veterinarian when pets are treated with antibiotics. 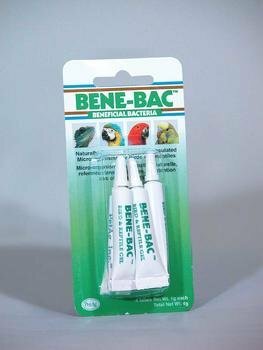 Great for breeders, exotic pet owners or average pet owners, Bene-Bac Pet Gel syringes insure you have the probiotics you need when you need them. Provides a guaranteed 20 million colony forming units (CFU) per gram of viable, lactic acid producing bacteria. If diarrhea or anorexia (loss of appetite) persist, contact your veterinarian. Bene-Bac probiotics are also available in other sizes and in powder form. Made in the USA.